I’m catching up posting on the last few stages of work on the tiny house. We had an excellent open house yesterday. We estimated around 40 people attended and it felt more like a community event. The tiny house is for sale now. Asking price is $15,000. I plan to package together all the plans, Sketchups and instructions for each step of the building project for sale too. Until then, here’s a tour of the completed tiny house just before the open house started. The sink takes up a lot of space but it folds away nicely in the corner if you aren’t using the side shelves. This entry was posted in Announcements and tagged tiny house interior, tiny house tour. Bookmark the permalink. Blushing….found the video after I posted on another area that I didn’t see it. 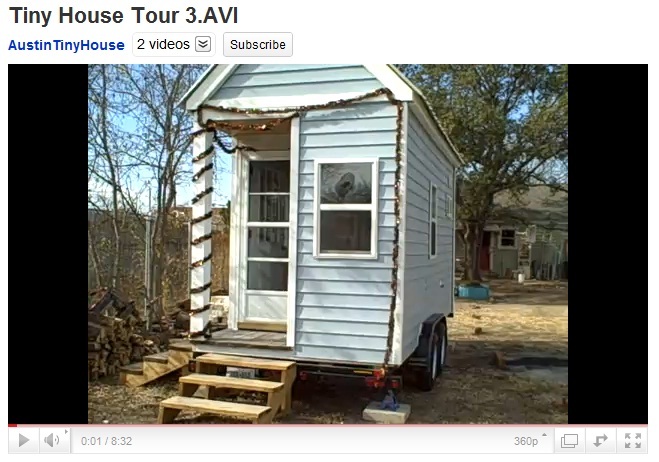 Thank you for the video and showing the inside of your tiny home. I love the ladder as it looks easier for an older person (not me!…I am never getting old!…sighs…only older…) to manage than just the regular kind. Thanks, Eadie. I patterned the ladder after a typical step ladder so folks would be used to the spacing and incline. An agile person can actually walk down it forwards without holding on. Wow! Love the house. Nice work and thank you for the tour for those of us who couldn’t make the open house. Did you build the kitchen sink setup yourself or did you purchase it somewhere? It’s a fantastic idea! Thanks, Hazel. I had an idea of what I wanted the sink to be and I built it myself. I figured that would be easier than trying to find something that would fit the exact dimensions and functionality I wanted.